Before last night’s U.S. presidential debate, it appeared that Donald Trump had what seemed to be a relatively easy task to win the U.S. presidential election. All he had to do was snag a small percentage of the African American vote—and by small, the number fifteen percent comes to mind. By many standards, to win only fifteen percent of a population is not a supremely difficult undertaking. Though for the Republican party in the U.S., it is a monstrous feat that they seem incapable of accomplishing. Working towards that fifteen percent, Donald Trump recently started on the African American bandwagon. He spoke to communities in Detroit, Michigan, to church leaders, and to groups of African Americans to persuade them that he is the presidential candidate who would change outcomes for them. In African American communities in the U.S., change is of dire necessity. Since Bill Clinton’s presidency, African Americans have been incarcerated in jails and prisons at alarming rates. Some are sentenced by racist judges to death, while others are forced to waste away their whole lives under the modern day slave system run by the private prison industrial complex. Still others leave jail or prison only to find no employment opportunities to make a decent living. What’s more, school systems in black neighborhoods are worsening under more privatization. And even more African American children suffer in poverty. Violence in African American communities has gotten center stage in U.S. media attention both from police shootings of unarmed black men and women and from shootings in places like Chicago, Illinois, a city that U.S. President Barack Obama claims as his home but has done little to effect change in those neighborhoods. Needless to say, there is much to be improved in African American communities. This fact has become a talking point in the U.S. general election presidential campaign. Donald Trump famously and rhetorically asked African Americans: “What have you got to lose?” He remarked that by voting Democrat for countless years, nothing has improved in African American communities and especially in inner-cities which have seen jobs leave for overseas markets or given underhandedly to immigrant workers for cheap wages. 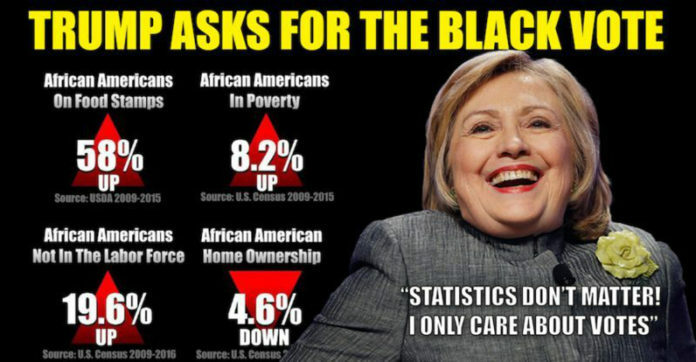 This “what have you got to lose?” is a fair question to ask African Americans since conditions have only worsened for them under the Clinton-Obama Democratic leadership. But after the first U.S. presidential election debate between Hillary Clinton and Donald Trump, I have to turn that question onto Trump himself: What does Trump have to lose by courting the African American vote? The die hard Republicans will inevitably vote for Trump, no matter what he says, so there is no threat of losing the “red states” that usually go Republican. There is only something to gain by advocating for African Americans: that fifteen percent threshold that will win Trump the election is attainable if only the Republicans would shed their sheer and unwarranted dislike of African Americans for one moment to realize that they need their votes in order to stand a chance in any future elections. Trump had a relatively easy task to obtain that fifteen percent. It could have been as easy as saying “Black Lives Matter.” Or to acknowledge that when unarmed black men and women are killed for absolutely no law enforcement reason and their families and children are left to move on without them, that this is a deplorable situation, and one that he wouldn’t wish upon anyone. Yet for whatever reason, it was too much of a task for Trump to forge even feigned empathy for the plight of black people in the U.S. When the debate moderator broached the subject of race and policing, Donald Trump doubled down on the rhetoric of “law and order” that won Reagan and Clinton presidencies in the 1980s and 1990s. Even more, he championed support for New York City’s “stop and frisk” policing, acts that were later shown to be linked to racial profiling in who was stopped, frisked, and arrested and where this accosting took place. It’s almost as though Trump forgot that Hillary Clinton was the reigning mass incarceration queen; he unwittingly fought for the title of mass incarceration king, took it from the incumbent Bill Clinton, and all but promised to bring stop-and-frisk policing to Chicago and other inner-cities nationwide. Now if there was a single way to lose the African American vote permanently and emphatically, I would have advised just that. Which makes me wonder why Republicans bother running for the highest office in the U.S. if they do not intend to show empathy for other racial groups besides whites. It’s not 1980 or 1990 anymore. The U.S. racial minority population is at thirty-six percent and rapidly growing. Based on this refusal to adapt alone, it remains no surprise why the Black vote is elusive for Republicans, and why all signs indicate it will be for Donald Trump. What is altogether missing from the Republicans as a whole is a lack of empathy for the condition in which the majority of African Americans find themselves everyday, most of which is largely not of their doing. This fact is not accepted by the majority of Republican party members. From the Republicans, there is no acknowledgment of racism, discrimination, prejudice, red-lining, segregation, privilege, or inequality, The Democrats, though also exacting racist policies, at least act the part of empathy and thus secure the Black vote with little effort. On Donald Trump’s ideas about trade and rebuilding the U.S. infrastructure so that roads and airports don’t resemble “third world countries,” he actually has an inspiring plan to allow the country to focus on itself and stop assuming the role of the world’s policemen, via USCommand in Africa and other occupation forces. After this debate, however, it is likely that we will never see that beacon of Trump’s plan enacted on a grand scale. His insensitive treatment of racial issues will sink his chances of cracking any meaningful percentage of the African American vote and give Hillary Clinton the landslide she was hoping for come November. The U.S. presidential campaign lifted off this evening at Hofstra University where Hillary met Donald in their first of three scheduled debates. Afiya X dissects some of what transpired and explains what now seems to be a straight shot for another Clinton presidency. The ineptitude of the Republican candidate, Donald Trump, to appreciate the most basic racial issues in the U.S. remains his biggest flaw. Perhaps, like Dubois said about most Americans: Donald is incapable of ordinary humanity and can barely be expected to sympathize with Blacks who he partly despises and partly hates. If this is Trumps strategy, of law and order, and of doubling down on Stop and Frisk, then certainly the old lady Tartuffe, Hillary, will have her chance to plunge the world into a flaming night–a Third World War! This is an objective reading of what happened tonight. Donald Trump is clearly disillusioned if he thinks he can win the presidency without a significant portion of the African American vote. Trump needs to stop hanging out with Giuliani and co. Those are some of the most racist people on the planet. They are fat cats and will sink his ship deeper into a bottomless abyss. Do you want to be president of America or president of white America? This is the question Trump needs to ask himself again before the next election. I am sitting here trying to prevent a third world war exploding on my head and Trump has no presence of mind to understand that he cannot dismiss the racial tensions in the U.S. with phrases like Law and Order or Stop and Frisk? Jesus! Does he really think at all? Hillary clearly won last night’s debate. Trump was doing just fine with his talk of the economy and then he seemed totally unprepared to give sensitive answers to racial issues. He’s done if this is how he really feels about African Americans. I guess for Blacks the devil you know is much better than the devil you don’t know. This race is won by the Hillary Camp if Trump continues to receive such crazy stupid counsel from the likes of Rudy Giuliani. Hahaha, Narmer Amenuti, you are disappointed? Were you expecting something different from Trump anaaa? See, you have ignored Trump’s biggest issue. He is ignorant, and his insensitivity to the current racial tension in the U.S. is not really his thing, although I have to admit that he might be a better president for the world, not for America I assume, but for the world than Hillary Clinton. The elections are his to lose. But he will lose it. Why? Like Akosua said about Dubois: Trumps is an ordinary American. He is incapable of ordinary humanity and can barely be expected to sympathize with Blacks who he partly despises and partly hates. Why do they keep saying African American and yet i never heard someone say european American?Narmer Amenuti this sounds more like a stereotype and racism to me. I beoieve if u american, u are an american either by birth or by other means. European Americans are actually Caucasians or Non-Hispanic Whites, or simply whites according to the US census data. African Americans can also identify as Black. I do not see how calling yourself African American instead of American or Black (which anyone can do) is racist except to say that calling others “White” or Caucasian, since they actually do not come from the Caucasus mountains is also racist? I am not sure where the charge of racism comes from Akwasi Mic? Well, that is the goal! Maybe one day when the dream of MLK is realized. But, there’s something to be said about diversity. One must be proud of their origins. It ignites the soul. And ignited souls do tremendous work for nations. Look how much African Americans have enriched America with African culture? The music, the soul, the food, the dance, the inventions, and more! There’s an argument to be made in being proud of who you are and where you come from. That is not to say one must use it to oppress others. That charge lies squarely in the laps of Caucasians in America who use their “whiteness” to oppress others. If anything, the charge of racism must be directed deservedly into Caucasian laps. You absolutely right!! No matter what, Africa will forever be our home and we forever remain black!! We got no where else than our motherland. I get surprised all the time when I see the brutalities against black people when as a matter of fact America was built with the blood of black people and immigrants.